As we age veins develop and appear closer to the surface of the skin. Alazzo Med Spa utilizes a laser to remove the smaller spider veins. We will have your legs looking great before you know it. Q: WHAT CAUSES SPIDER VEINS TO APPEAR? Medical history. Being born with weak vein valves increases your risk. Having family members with vein problems also increases your risk. Hormonal changes. These occur during puberty, pregnancy, and menopause. Taking birth control pills and other medicines containing estrogen and progesterone also may contribute to the formation of spider veins. Pregnancy. During pregnancy, there is a huge increase in the amount of blood in the body. This can cause veins to enlarge. The growing uterus also puts pressure on the veins. More spider veins usually appear with each additional pregnancy. Obesity. Being overweight or obese can put extra pressure on your veins. Q: WHAT SHOULD I DO AFTER A TREATMENT? A: Compression stockings are recommended for 2-3 days for spider veins and 5-7 days for reticular veins following treatment. Q: HOW DOES LASER THERAPY WORK ON VEINS? A: The laser is directed at the vein and laser light is absorbed by the vessel causing the vein to collapse or break apart. 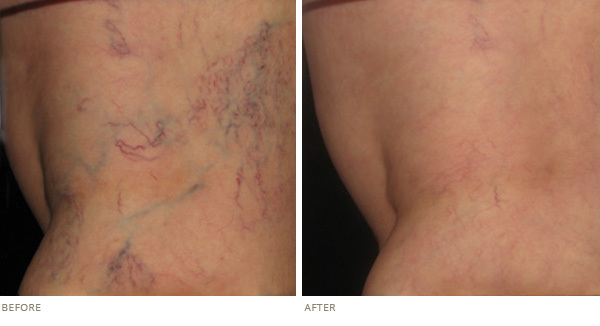 Spider veins can disappear immediate. A: Laser therapy is calculated in 15 minute increments.